CD25+ regulatory T (Treg) cells. Combination of CTLA-4 blockade and depletion of CD25+ Treg cells results in maximal tumor rejection. Efficacy of the antitumor therapy correlates with the extent of autoimmune skin depigmentation as well as with the frequency of tyrosinaserelated protein 2 180–188 –specific CTLs detected in the periphery. Furthermore, tumor rejection is dependent on the CD8+ T cell subset. Our data demonstrate that the CTL response against melanoma antigens is an important component of the therapeutic antitumor response and that the reactivity of these CTLs can be augmented through interference with immunoregulatory mechanisms. The synergism in the effects of CTLA-4 blockade and depletion of CD25+ Treg cells indicates that CD25+ Treg cells and CTLA-4 signaling represent two alternative pathways for suppression of autoreactive T cell immunity. Simultaneous intervention with both ris therefore a promising concept for the induction of therapeutic antitumor immunity." I contacted Dr. Roger P.M. Sutmuller from the Netherlands because I knew that in My therapy, I somehow overcame the T-Reg cells that surpress the immune response. In his research, he and colleagues had found out that if you deplete the T-Regs, it enhanced the immune response. So I took this one step further and noticed that if you delayed the addition of IL-2 after the CD4+T cell activation, we also overcame the Treg supression. The is due to a Novel Mechanism call Indexation. 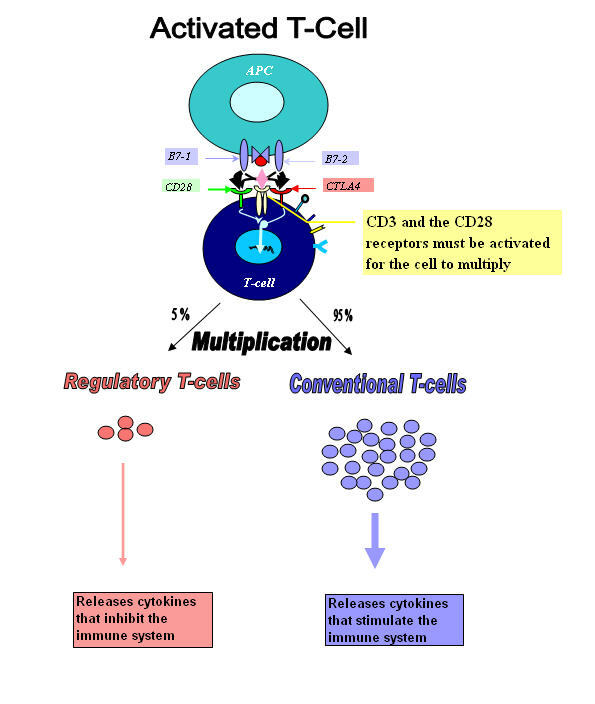 The Tregs (CD4+CD25+ Regulatory T cells) are indexed to the number of IL-2 producing cells. This Means that their proagation is tied to the secretion of IL-2 during the expansion of the CD4+ T cells. IL-2 is the rate limiting factor. So if you delay the addition of IL-2, then you contol the Tregs. So Lets go back to The infamous Chart. In the bottom chart you can see the IL-2 addition took place at the CD8+ T cell maximum propagation not at the cd4+ T-cell Maximum. So we controlled the propagation of the T Regs and in the process helped the CD4+,CD8+ activation to generate the Immune response. National Institutes of Health (NIH) researchers have identified a gene that suppresses tumor growth in melanoma, the deadliest form of skin cancer. The finding is reported in the journal Nature Genetics as part of a systematic genetic analysis of a group of enzymes implicated in skin cancer and many other types of cancer. 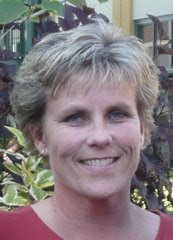 This Sunday we have lost Kathy Miller to the Beast, Melanoma, Please if you have the time, go over to Kathy's carepage. What really upsets me is we cound not get the CTLA-4 that she desperately needed as the last hope. A new approach primes antibodies to instantly attack cancers, HIV, and other diseases. "Now researchers at the Scripps Research Institute have developed preprogrammed chemicals that bind to antibodies and tell them how to recognize part of a pathogen, known as its epitope. In experiments, the team found that such chemicals prompted a therapeutic immune response that inhibited the growth of two types of tumors in mice. The researchers published their findings in the latest issue of the Proceedings of the National Academies of Science." "We used a chemistry-based approach that wouldn't induce antibodies that might be wasted," says Carlos Barbas, a professor of molecular biology and lead investigator on the paper. "[This approach] could focus an immune response on functional epitopes of the pathogen, be it cancer or a virus." "Howard Kaufman, director of the Mount Sinai Melanoma and Sarcoma Program, studies cancer's immunosuppressive mechanisms, particularly in melanoma, and is beginning phase I clinical trials to test a melanoma vaccine. Kaufman says that Barbas's vaccine technique represents a new way to treat cancer and other diseases. "It's appealing as an approach," says Kaufman. "It's a way to get instant immunization as opposed to waiting for kinetics to develop T cell responses." I think you may find our ASCO abstracts interesting this year. Especially the one that talks about the time dependent variability of immunoreactivity in patients with melanoma. The American Society of Clinical Oncology (ASCO) is the world's leading professional organization representing physicians who treat people with cancer. Meeting.I am trying to get this out to all the clinical Oncologists. So they can incorporate this into there trials. I hope I am not stepping on any Toes. There is some very hopeful data out there this morning on cancer survival. Bristol-Myers Squibb Co. (NYSE: BMY) and Medarex, Inc. (NASDAQ: MEDX) have released updated survival data from three Phase II studies of ipilimumab in patients with advanced metastatic melanoma in Stage III or IV levels who had previously been treated showing that approximately half of patients who received ipilimumab remained alive beyond one year. One-year survival rate of 47% in patients who had progressed while onor after receiving standard treatment (Study 008);follow-up for survival was up to 24.8 months. One-year survival rate of 48% in patients who were previously treated,relapsed or failed to respond to experimental treatment or were unableto tolerate currently approved therapies (Study 022);follow-up for survival was up to 21.88 months. One-year survival rate of 51% in patients previously treated withtherapy other than ipilimumab (Study 007); follow-upfor survival was up to 26.32 months. As you can see, I am not blowing smoke or doing Hat Tricks. DATE: March 26-27, 8:00 a.m.
NYAS, 212 298-8639, Email: kkilpin@nyas.org. This event is a public, two-day forum that will focus on the clinical use of cytokines and cytokines antagonists as therapeutic agents for the treatment of human diseases, including cancer and autoimmune disorders such as rheumatoid arthritis, multiple sclerosis and inflammatory bowel disease. Guess What I did, You got it. I hope it doesn't fall on deaf ears. Much of what is known about how ultraviolet radiation (UV) causes skin cancer relates only to basal cell and squamous cell carcinoma. For melanoma, a less common but far more deadly form of the disease, there has been less evidence. New research suggests that UV-induced mutations in a gene called PTEN that normally suppresses tumors may play an important role in the formation of melanoma, according to findings published yesterday in the Proceedings of the National Academy of Sciences. Researchers from NCI’s Center for Cancer Research and their collaborators at Brown University analyzed 59 melanoma samples taken from 8 patients with xeroderma pigmentosum (XP) who were seen at the NIH Clinical Center between 1971 and 2008. XP is a rare genetic disorder that compromises the ability of cells to repair DNA damage to the skin, putting these patients at a nearly 1,000-fold increased risk of melanoma, which progresses rapidly. The researchers found that 56 percent of the XP melanomas analyzed harbored mutations in the PTEN gene. Of these mutations, 91 percent included DNA base substitutions of the type that usually result from UV damage, with between 1 and 4 changes per tumor. These mutations were also detected among melanomas in situ, those at the earliest stage of disease. Melanomas from the same person sometimes had different PTEN mutations, indicating that they arose independently. Temozolomide (brand names Temodar and Temodal Schering-Plough Corporation) is an oral alkylating agent which can be used for the treatment of Grade IV astrocytoma -- an aggressive brain tumor, also known as glioblastoma multiforme. The agent was developed by Malcolm Stevens and his team at Aston University in Birmingham, UK. A derivative of imidazotetrazine, temozolomide is the prodrug of MTIC (3-methyl-(triazen-1-yl)imidazole-4-carboxamide). It has been available in the US since August 1999, and in other countries since the early 2000s. When I came across this Research paper "Genomic and Molecular Profiling Predicts Response to Temozolomide in Melanoma", I contacted Dr. Christina Augustine. respond to Temozolomide, then you could help those with the right genotype. or alternative chemotherapeutic reagentsmight be desirable." Ed took the day off but NED took his place. Camparison: CT scan Chest, abdomen and pelvis, no evidence of reocurrence. 2.) No focal hypermetabolism elsewhere!!!!!!! This not about who has what product? This about a theory and therapy that will make your product the greatest invention since sliced bread. Your product has the potential of help cure Melanoma. The dose has to be 15mg/Kg to invoke an innate immune response. 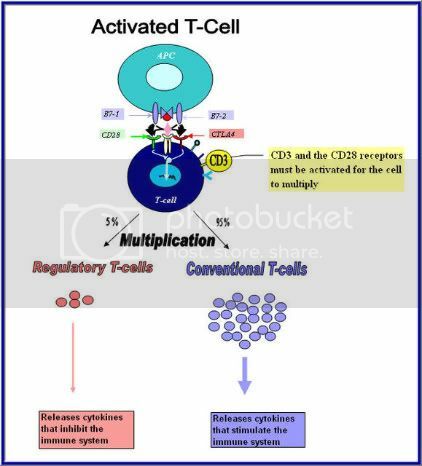 Once that has happen, the Interluekin -2 (growth factor) promotes propagation and is need to activate the CD8+ Tcell. IL-2 Regulates Perforin and Granzyme Gene Expression in CD8+ T Cells Independently of Its Effects on Survival and Proliferation. With all this said and done, IL-2 needs the get Immune response started. That is done by your Monoclonal Antibody. “The Magic Bullet”. The rest is the same as Dr. Rosenburg Letter. I am still trying to make contact with Novartis the, Manufacturer of Interluekin-2. I don't have a contact name or email yet. I hope to get one soon. If any one has a contact please get intouch with me. “Our latest treatment has a 72% objective response rate with 36% complete responses. Well now I have a request for you. I have been data mining on the internet and have been able to piece together why my combination therapy worked. Below is a graphical representation of what went on using time as the x axis. I was inoculated with anti-CTLA-4 mAb at the dose of 15mg/kg. Recent advance in autoimmunity research reveals that the innate immune system is able to recognize self-targets and initiate inflammatory response in a similar way as with pathogens. This is what anti-CTLA-4 blockage has done. Accordingly, alterations in cell morphology are recognized by the innate immune system resulting in an acute inflammatory response (Carroll and Holers,2005). As you can see the innate immune antibody response takes about two weeks. In my therapy The Inflammatory response happen in 15 days. Pinpointing when T cell costimulatory receptor CTLA-4 Is Engaged. In my therapy, I am trying to follow what had transpired and to try to back the findings up with scientific facts. So, after the inoculation of the 15mg/Kg of Tremelimumab (from Pfizer) IgG2 what happened? Based on scientific theory the Monoclonal antibody blocks the CTLA-4 receptor causing the T-cell to stay active. So If my body’s chemistry is right, when and how do we know if the CTLA-4 blockage is engaged? Dr. James Allison and colleagues in the late 1990’s did some studies with mice. In the mouse model, the anti-CTLA-4 blockage caused an autoimmune response which was diabetes in the mice. Before I go any further, I must make a note of caution. That is not all immune responses in mice models crossover to the human model, but the models are usually a good predictor. So with that said, In the research paper “Pinpointing when the T-cell costimulatory receptor CTLA-4 must be engaged to dampen diabetogenic T-cells”, it took about 12 days to see a response to the Anti-CTLA-4 mAb. So if we have the danger signal and the B7 receptor blocked, all we need now is the antigen and the TCR T cell receptor to be engaged. “Three major events must occur to induce CD8+ T cell–mediated, tumor-protective immunity against syngeneic melanoma. First, the T-cell receptor must be triggered by a (or multiple) self antigen–derived peptide MHC class I complex (7–13). Therefore, this event depends entirely on appropriate antigen presentation, which is most efficiently provided by mature dendritic cells (14). Peripherally tolerant or “ignorant” self-reactive T-cell clones, once properly activated, may serve as tumor-specific effector T cells (15, 16). Second, simultaneously with T-cell receptor triggering, a distinct second costimulatory signal must be delivered, mediated by IL-2, B7-1, or B7-2, which engage IL-2 receptors and CD28 on the surface of the T cell, respectively (17). A source of these cofactors for effective CD8+ T-cell stimulation can be provided by CD4+ T cells that release critical amounts of IL-2, or by mature dendritic cells that display an increased level of B7-1/B7-2 costimulatory molecules on their cell surfaces. These CD4+ cells bind to antigen presented by antigen-presenting cells (APCs) like phagocytic macrophages and dendritic cells. The T cells then release lymphokines that attract other cells to the area. The result is inflammation: the accumulation of cells and molecules that attempt to wall off and destroy the antigenic material (an abscess is one example, the rash following exposure to poison ivy is another). These CD4+ cells, called helper T cells, bind to antigen presented by B cells. The result is the development of clones of plasma cells secreting antibodies against the antigenic material. So now with all three signals in, place we have the ability for cross priming the CD8+ T cells and clonal expansion. But if you inoculate the system with IL-2 too early, you have CD4+ T cell expansion, and with that the CD4 Tregs increase as well which will suppress the immune response. The therapeutic use of IL-2 is associated with a preferential expansion of CD4 cells expressing CD25, the alpha chain of the IL-2 receptor. The therapeutic use of IL-2 for HIV patients was aroused by an article by Kovacs et al. that appeared in the New England Journal of Medicine. That paper described a sharp increase in CD4 counts with a concomitant stable number of CD8 cells in 25 patients treated with IL-2. reduced survival with increased infiltration of Treg cells. They can inhibit the function of tumor infiltrating T cells (TILs). With that in mind, In 1988, a research paper came out authored by Dr. Kyogo Itoh , Platsoucas,and Balch entitled: “Autologous Tumor Specific Cytotoxic Lymphocytes in the Infiltrate of Human Metastatic Melanomas” Activation by Interleukin 2 and Autologous Tumor Cells, and Involvement of the T Cell Receptor. In the report all twelve Metastatic Melanoma tumor cell suspensions activated by IL-2 , TILs were present to a large degree. This confirmed your theory earlier. The TIL cell count increased to a maximum propagation in about 43 days. Tumors cells that were cultured with the TILs and the IL-2 were complete killed off. Lysing appeared five days into the experiment. The cytotoxic activity lasted for at least 59 days. In the control, without IL-2, the TILs eventually die off leaving the tumors cells enacted. In the above paper, It documented how long it takes to get maximum propagation of the CD4+, CD8+ and CD3+ T-cells. So I overlaid that information on my therapy. CD4+ T-cells propagate first, so if you inoculate at the CD4+ T-cells, you will generate more CD4+ clones. It just so happens that the Il-2 therapy was introduced at the maximum CD8+ T-cell growth curve The same with the CD3+ cells also. If lymphocytes (CD8+ T-cells) are cultured in the presence of Interleukin 2, it results in the development of effector cells which are cytotoxic to tumor cells. So it looks like timing plays a major factor in how the Immune response plays out. I n a paper called “Opposing Effects of IL-2 in Tumor Immunotherapy: Promoting CD8+ T cell Growth and Inducing Apoptosis”. It showed in mice that the addition of IL-2 on the 4th and 5th day instead of days 1 and 2 had a dramatic effect on the couse of the response.Instead of being gone by day 12, the response lasted through day 30th. This was an indication that the timing of the IL-2 incoluation plays a major role in sequence response and duration. Also, Prolong therapy with Il-2 has been shown to may hinder the CD8+ T cells. To summarize, Timing and Doses of both Anti-CTLA-4 and IL-2 can have a major effect on the immune response outcome. If you follow the dosing and timing regime, I postulate that you will see a synergist outcome with this combination therapy. Please review my theory and make any comments. 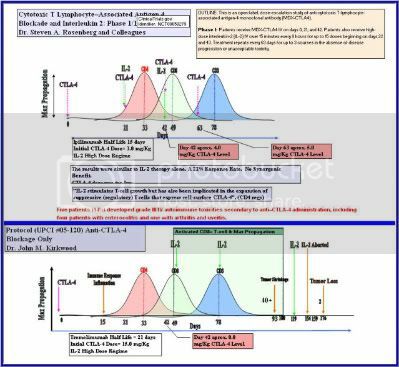 Also I am enclosing a comparison graph of the IL-2 and CTLA-4 that you and your colleagues tried compared to the therapy I went through. Thanks for listen and I hope to hear from you soon. I am in the process of writng to Medarex and Dr. Roesnberg at NCI. I 've been data mining on the internet and I have been able to piece a sound theory together. It has taken me over a year to put all the pieces together. I started at the edges and worked my way across the board. I am putting the final pieces in and it is my belief that I found a needle in the hay stack. It may not be the only way to get to a stabilization, but I think I am on the "Yellow brick road". Now it is time to see the great Wizard of OZ, Dr. Rosenberg. I hope He will give a thumbs up (Brain). So I am off to see the Wizard. 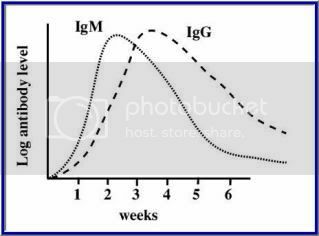 And in the previous post this graph shows when the innate immune response should take place by a natural antibody. Check out the timeline. The maximum response is at about two weeks. My Inflamoratory response happen in 15 days. This is not a coincidence!!!!!!! Recent advance in autoimmunity research reveals that the innate immune system is able to recognize self-targets and initiate inflammatory response in a similar way as with pathogens. This is what anti-CTLA-4 blockage has done. Accordingly, alterations in cell morphology are recognized by the innate immune system resulting in an acute inflammatory response (Carroll and Holers,2005). With this in mind, I had an Innate immune response when the CTLA-4 engage the B7 receptor. The response was an inflamatory response on day 15. Base on the Innate immune response froma natural antibody. It takes about two week to generate a response.This response I posulate as the danger signal needed for T-cells to begin their frontal attack on the foreign invaders (The Cancer Cells). I am in contact with Kirkwood and Medarex trying to convince them of my theory. I has been a hard sell. 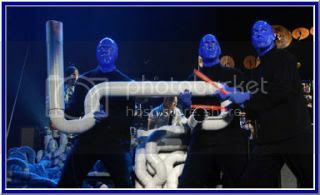 Well, I have my front row seat to the "Blue Man Group" All the clinging and banging in the tube reminds me of the Blueman Group. I have my ear plugs!!!! Labels: CT Scan, Jimmy B. Well while I was on my way to the candy store, I jumped the cyber plane to London. The concord just would not do. This site contains material which was prepared for a course in Pathology, which was delivered to bioscience, veterinary and medical students. I believe we are all medical students here. So, Lets begin. There will be a final at the end worth 50% of your Grade. Can you say "Back to School"
In my research, I ran across this powerpoint presentation on Cellular Immunotherapy. I gave me a better understanding on what may be happening to Us cancer Patients. Center for Molecular Medicine Cologne Germany. Please take time to Review it. Thanks to Donald Bohlken for bring this to my attention. “I thought you might be interested in that attached article from the January 25, 2009 issue of the journal "Nature Materials" concerning a Harvard study of a new vaccine methodology which resulted in a 90% survival of mice infected with a melanoma strain which would normally kill them in 25 days. The article speaks of this result as a "cure". The article synopsis notes: "Cancer vaccines typically depend on cumbersome and expensive manipulation of cells in the laboratory, and subsequent cell transplantation leads to poor lymph-node homing and limited efficacy. We propose that materials mimicking key aspects of bacterial infection may instead be used to directly control immune-cell trafficking and activation in the body. It is demonstrated that polymers can be designed to first release a cytokine to recruit and house host dendritic cells, and subsequently present cancer antigens and danger signals to activate the resident dendritic cells and markedly enhance their homing to lymph nodes. Specific and protective anti-tumour immunity was generated with these materials, as 90% survival was achieved in animals that otherwise die from cancer within 25 days. These materials show promise as cancer vaccines, and more broadly suggest that polymers may be designed to program and control the trafficking of a variety of cell types in the body." This is Nano and Transdermal Technology at its best. “Bioengineers at Harvard University have shown that small plastic disks impregnated with tumor-specific antigens and implanted under the skin can reprogram the mammalian immune system to attack tumors. The research -- which ridded 90 percent of mice of an aggressive form of melanoma that would usually kill the rodents within 25 days -- represents the most effective demonstration to date of a cancer vaccine. Harvard's David J. Mooney and colleagues describe the research in the current issue of the journal Nature Materials. "Our immune systems work by recognizing and attacking foreign invaders, allowing most cancer cells -- which originate inside the body -- to escape detection," says Mooney, Gordon McKay Professor of Bioengineering in Harvard's School of Engineering and Applied Sciences. "This technique, which redirects the immune system from inside the body, appears to be easier and more effective than other approaches to cancer vaccination." Most previous work on cancer vaccines has focused on removing immune cells from the body and reprogramming them to attack malignant tissues. The altered cells are then reinjected back into the body. While Mooney says ample theoretical work suggests this approach should work, in experiments more than 90 percent of the reinjected cells have died before having any effect. The implants developed by Mooney and colleagues are slender disks measuring 8.5 millimeters across. Made of an FDA-approved biodegradable polymer, they can be inserted subcutaneously, much like the implantable contraceptives that can be placed in a woman's arm. The disks are 90 percent air, making them highly permeable to immune cells. They release cytokines, powerful attractants of immune-system messengers called dendritic cells. Donald Bohlken actually contacted one of the collaborators, Dr. Glenn Dranoff of the Dana Farber Cancer Institute and Harvard Medical School. He indicated: "We are initiating efforts to bring this to clinical testing, but it will take some time to adapt the procedures to patients. A one year time frame is a reasonable guess." If this crosses over from the mouse model to the human model, we may have a winner on our hands. A 90 % response and if they are complete responses, this technology would surpass any therapy out there to date. The main take away is that they are prompting our immune system to recognize the tumors by activation of the T-cell. Rosenberg and Hwu and other colleagues are doing just that with (ACT) Adoptive Cell Transfer. Kirkwood, Camacho, Webber, Hodi, Maker, O’Day and Wolchok did that with anti-CTLA-4 blockage. I can see the Light at the end of the tunnel!!!!!!!!!!!!!!!!!!!!!!!!!!! Thank you Don for advocating for us and your Brother Ron who is a fighting Warrior of Melanoma. 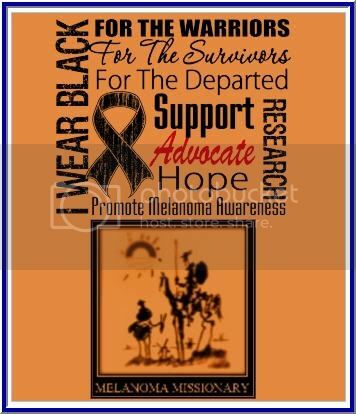 I will post the research paper on Melanoma Missionary for everybody. Pinpointing when T cell costimulatory receptor CTLA-4 Is Engaged. In my therapy, I am trying to follow what had transpired and to try to back the findings up with scientific facts. So, after the inoculation of the 15mg/Kg of Tremelimumab (from Pfizer) IgG2 what happened? Based on scientific theory the Monoclonal antibody blocks the CTLA-4 receptor causing the T-cell to stay active. So If my body’s chemistry is right, when and how do we know if the CTLA-4 blockage is engaged? Well, I am excited to have my Full Body PET scheduled.This is what I call make or break time. It has been 24 months since therapy. They say the long time from relapse, the better the chance are for survival. So the drum roll will start on Monday and Johnny C. will be presenting the envelope on Wednesday most likely. I am ready for "HERESssssssss Johnny"
Ed will be at the controls. LETS RIDE THE TUBE ONCE MORE!!!!!!!!! Some patients have indeed experienced tantalizing responses after treatment with CTLA4 antibodies. Let me assure you that many of us in the field keep working hard on figuring out what explains those successes so that, armed with that knowledge, we can extend the benefit to many cancer patients. Experts agree that the way forward requires combinations of immunotherapies. Despite the many obstacles (scientific, regulatory, operational, intellectual property, economic, etc), Pfizer Oncology is moving decisively in that direction. The author, Suzanne McGettigan, MSN, CRNP, is a speaker for the Amgen, Inc. speaker’s bureaus. Carolyn Vachani, MSN, AOCN and Margaret Hampshire, BSN, OCN (planning committee members) have no financial relationships to disclose. This activity is supported through an unrestricted educational grant from Bristol Myers Squibb. "Kinetic analysis revealed that the stimulation generated by anti-CTLA-4 administration was not yet obvious after 3 days, except for serotype 3, for which a small stimulation was observed. Seven days after anti-CTLA-4 treatment, a clear and significant stimulation was observed that was comparable with the stimulation found after 14 days". "The effect of anti-CTLA-4 treatment on the anti-caps-PS immune response was dose-dependent. A 2.3-fold increase of the specific anti-caps-PS immune response to serotype 3 was observed after administration of 200 µg 4F10, whereas an eightfold increase was observed after administration of 400 µg 4F10 (data not shown)." I believe the puzzle is coming togther very nicely. Now all we have to do is get the Oncologists on board. To maintain tissue homeostasis under the duress of infection or injury, the immune system is endowed with a diverse repertoire of soluble and cellular effectors. The innate response, composed of granulocytes, macrophages, dendritic cells, natural killer cells, and complement, is rapidly triggered into action, detecting tissue disturbance through a set of germline-encoded pattern recognition receptors. The adaptive reaction, consisting of antibody-producing B cells and T lymphocytes, is slower to develop, but manifests exquisite specificity and memory. These attributes reflect the requirement for expansion of rare clones harboring somatically rearranged immunoglobulin molecules or T-cell receptors specific for foreign proteins or processed peptides presented by major histocompatibility complex (MHC) molecules. These innate and adaptive responses are carefully orchestrated through soluble and membrane-bound regulators, resulting in the deployment of the most suitable effectors for containing the disorder, while minimizing tissue damage. Cancer cells similarly provoke immune recognition. In one pathway, innate effectors detect tumor cells directly.1 Natural killer cells and phagocytes express NKG2D molecules that function as receptors for stress-related genes such as MICA and MICB, which are induced as a consequence of cellular transformation. Natural killer cells further scan for the loss of MHC class I molecules on the surface of tumor cells. Dendritic cells use a variety of scavenger receptors to result in the phagocytosis of dying tumor cells. The adaptive response exploits an indirect pathway, termed cross-priming, to recognize cancer cells.2 In this mechanism, dendritic cells capture tumor cell debris, migrate to regional lymph nodes, and stimulate CD4+ and CD8+ T cells with tumor specificity. Primed T cells thereby acquire the capacity to detect tumor cells directly in a MHC-restricted fashion. CD4+ T cells also contribute to B-cell antibody production. "Our NIH doc seems to think that TIL patients have a better response with this drug(CTLA-4) "possibly" than the general population." "I was told yesterday that the "Til Harvest" that MDA,(MD Anderson) is doing is seeing more response (positive) to patients that have had IL-2 prior to using their T-cell harvested cells." I think this will give US ALL a fighting chance. I CAN SEE THE LIGHT AT THE END OF THE TUNNEL!!!!!!!!!!!!!!!!! "Sloan Kettering was such a pleasant experience. I felt very comfortable there. As weird as it sounds I felt like I was booking into a hotel…waterfalls, concierge, coffee/snacks, and comfy couches and chairs. The staff was so friendly, helpful and comforting. Everything was so organized. I mean it was sad as well because despite the beautiful environment the people looked so tired and sick. I felt for them. But I have to say most of them had a smile on their face and were in good spirits…it was inspiring. Dr. ----- explained all treatment options, both those that Sloan doesn't administer and those that they do. He spoke about interferon explaining that it is the only approved drug for Melanoma. But he said that Sloan no longer administers Interferon. Their school of thought is that Interferon is only found to be effective for short term (5-7 years) and doesn't show a difference in the long term for patients. So....given this and the intense side effects (for an entire year) Sloan encourages other treatments. However, he did say that it seems to be more effective for younger patients. And he did have two younger patients in their 20's get interferon which seemed to work well. But he said that he would only suggest 1 month and not the full year (It shown to have the same results with a hell of a lot less side effects). It's also an immune therapy treatment that is believed to contribute to the body's immune reaction, thus helping it kill cancer cells. It is given as an IV but half of the people in the clinical trial will be given a placebo (saline aka nothing...no treatment!). Also, the results of the study's effectiveness won’t be available till next year. Other clinical trials were mentioned but there is a long waiting list and he said the CTLA-4 trial would be the most appropriate for my situation. 3- Observation (every 3 months) + CT Scans (every 6 months) – My follow up will be at Sloan. I ended up going to NIH and going through the TIL trial. Everything worked out well during the trial... no adverse reaction to chemo or IL2. I had 10 doses with no problem. They gave me back 76 billion of my killer CD-8s and I went home 2 1/2 weeks later. The only side effect was lingering low red blood cell count. I received 2 transfusions and am now my marrow seems to be on the mend. My first trip back to NIH was mixed. The tumors were slightly bigger, but there was a lot of hemoraging and necrosis which could account for the increase due to edema. We would wait another month. Month two. We just returned and two in my liver were larger, but everything else was static. But, this time they did a brain MRI and found a 7mm met at the top of my cerebellum. Looking back to the brain MRI before the trial our doc thinks it may have been there only too small to be noticed. During late Dec./early Jan. my tumors grew at a rapid pace and we figure this may be when the growth occurred. Anyway, NIH will not be following me anymore due to that met. I feel like the TIL trial is still working... everyone reacts differently and late responses seem more durable than early response. So, we are looking for the next available trial. I'm trying to get into a MDX CTLA-4 blockade trial at Vanderbilt which specifically requires a brain met. Since mine is small and not causing any symptoms currently I think this might be a good path. 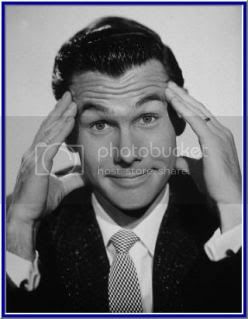 It would at least provide a good following of my brain with scans... so bothersome with insurance. If there is any serious growth I can still go for the cyber-knife. I was avoiding cyber-knife since it requires a major dose of steroids and would effectively negate any positive effect of my TIL trial. I would be greatly interested in what you think of our plan and if you know of anything else out there. Do you know anyone who has been successful with MDX? Our NIH doc seems to think that TIL patients have a better response with this drug(CTLA-4) "possibly" than the general population." As you see, my Research seems to hold water. I am more convinced than ever that we are on the right track. I was told yesterday that the "Til Harvest" that MDA,(MD Anderson) is doing is seeing more response (positive) to patients that have had IL-2 prior to using their T-cell harvested cells. They told me currently there is a 36 year old female patient being treated and she is almost NED....she had lung lesions, did IL-2, and now is doing T-cell. You're much more technical than I am, but I think that goes along w/ your hypothesis....the cells were pre-activated and then more responsive when the T-cells were used. Well done my faithful servant! Thank you for your email. It has been forwarded to our clinical development team. We are continuing to develop Ipilimumab with Bristol-Myers Squibb and studies are ongoing. Dr. Luis Camacho, I am asking for your help. Based on my success, we need to propose a clinical trial. I have spent numerous hours researching my combination therapy. I believe this merits an investigation. “Three major events must occur to induce CD8+ T cell–mediated, tumor-protective immunity against syngeneic melanoma. First, the T-cell receptor must be triggered by a (or multiple) self antigen–derived peptide MHC class I complex (7–13). Therefore, this event depends entirely on appropriate antigen presentation, which is most efficiently provided by mature dendritic cells (14). Peripherally tolerant or “ignorant” self-reactive T-cell clones, once properly activated, may serve as tumor-specific effector T cells (15, 16). On day 15 there inflammation around my axilla tumors.So all three signals were in place. Source: The Maximum Propagation time was from ITOH ET AL. If you look at the graph, High dose was inoculated at the maximum CD8+ T cell propagation. This IL-2 addition promoted the induction of effector function. At about the same time the CTLA-4 was almost out of my system base on the half life. This is why I had no autoimmune response side effects. IL-2 is commonly used as an adjuvant in immunotherapy protocols. In addition to playing a critical role in survival of CD8 T cells, when presented at high levels to antigen-activated CD8 cells, IL-2 can also promote the induction of effector functions, such as granzyme B (gzmB) via STAT5 signaling, thereby functioning as a costimulatory molecule and also as growth factor. “Granule-mediated cytotoxicity is one of the major mechanisms used by CD8+ T cells to eliminate harmful or foreign bodies, such as virus-infected cells, tumors, and allografts. After Ag recognition, activated CD8+ T cells release the contents of their cytotoxic granules into the extracellular space, where they are taken up by the target cell, and apoptosis is initiated (1). The cytotoxic granules contain a number of molecules, including the pore-forming protein, perforin, and serine proteases, known as granzymes. Perforin was originally thought to cause cell lysis by penetrating the target cell membrane (2), but recent work favors the theory that perforin functions by enabling the granzymes to escape from endosomes into the cytosol of the target cell (3, 4). Whatever its exact role, perforin is essential, because Ag-specific granule-mediated cytotoxicity is absent in perforin-deficient CD8+ T cells and NK cells (5).”Although the perforin and granzyme genes are known to be inducible, because a T cell must be activated before the cytolytic molecules are expressed at the mRNA or protein levels (13, 15), the signals responsible for regulating gene expression have yet to be identified. The exceptions are studies examining the role of the cytokine, IL-2. IL-2 has been shown to up-regulate perforin and granzymes A and B in human PBL (16), and binding sites for the IL-2-induced transcription factor, STAT-5, have been located in the perforin promoter region (17, 18)." This is what I believed happen to me. I believe we need to investigate it. Since I am not Research Oncologist, I don’t know if anyone would take me serious. I went from 40 + nodulars in my lungs to NED and have been NED for two years.I believe we jump started my immune system. Hint: Mr. CTLA-4 Himself, Dr. Luis Camacho in Texas!!!! On 10-24-2005 when I was first diagnosed with melanoma, I contacted Dr. Luis H. Camacho who was currently at MD Anderson. Thank you for your note. The CTLA4 antibodies in melanoma are currently under development and completing the approval process with the FDA (Phase II and Phase III). The overall response rates in my mind will be near 20-30% with a good number of patients attaining long term remissions. However, none of the programs are currently oriented to patients rendered NED (Stage III or IV). They are in fact for patients with advanced disease. From your brief introduction, I think your best options are to obtain an HLA typification and go for an adjuvant trial. Thanks for your note. You really refreshed my mind! I am glad things have worked out relatively well for you!. Did you get rid of your disease?. I am glad you are writing your story and hopefully inspiring a number of patients in dire need of hope. Let me know how can I help. Now I can hopefully get Dr. Camacho to propose a Clinical Trial based on my success. This my Dream. As Bruce Springstein "I am working on a Dream". 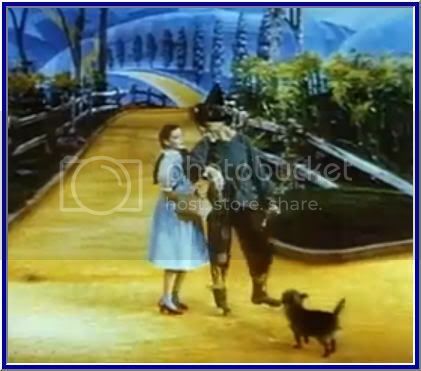 And If I have the research right it may be one of the paths to the "YELLOW BRICK ROAD"
Tremelimumab given at two dosing regimens afforded durable tumor responses in patients with metastatic melanoma, according to data from a phase-1/2 trial. Researchers conducted a phase-1/2 trial to assess the safety of tremelimumab in multiple doses and to examine the efficacy of the agent and the appropriate dosing regimen. To determine the recommended phase-2 dose, phase-1 IV infusions of tremelimumab at 3 mg/kg, 6 mg/kg or 10 mg/kg were given to 28 patients with metastatic melanoma for up to one year. During phase 2, 89 patients received tremelimumab 10 mg/kg once each month or 15 mg/kg every three months. The researchers reported no dose-limiting toxicity during phase 1. Eighty-four patients were assessable for response during phase 2 at which time 10% reached objective antitumor responses; one complete response and three partial responses in each dosing regimen comprised the best overall objective response. Most responses ranged from three to 30 or more months and the most common adverse events were diarrhea, rash and pruritus. Grade-3/4 adverse events had a frequency of 13% in the 15 mg/kg arm and 27% in the 10 mg/kg arm. Frequency of serious adverse events was 9% in the 15 mg/kg arm vs. 23% in the 10 mg/kg arm. The phase-3 data from ASCO, in terms of survival, show that tremelimumab given at 15 mg/kg every three months is a bit better than for the control arm of dacarbazine (DTIC-Dome, Bayer Healthcare) or temozolomide (Temodar, Schering). But, the difference was not statistically significant; median survival was a month better, but this is less than we were looking for. So we must ask: What is the real difference between clinical responses to tremelimumab and dacarbazine? 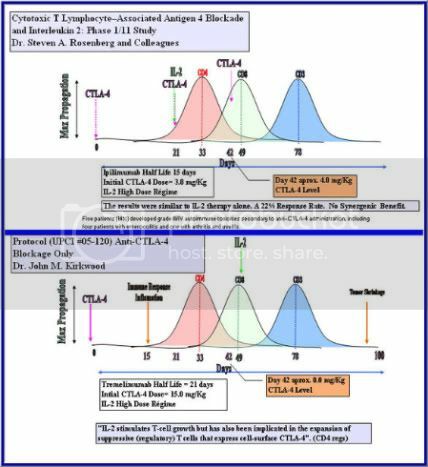 In the recently published study of Camacho et al reporting the phase-1/2 experience and the larger phase-2 multicenter study I presented to ESMO and ASCO in 2008, as well as in the phase-3 experience that Toni Ribas presented to ASCO, there are very profound differences between the type of responses seen with anti-CTLA4-blocking antibodies and with conventional chemotherapy. About 8% to 10% of patients with melanoma have objective response to this modality and the majority of these have a very durable response. For example, in the phase-2 trial results I reported to ASCO and ESMO, 15 of 16 patients who had objective response with tremelimumab response was durable past six months -a very different pattern than we see for dacarbazine and temozolomide. Tremelimumab and ipilimumab are active agents in a fraction that is roughly the same as interleukin-2, interferon-alfa, and dacarbazine or temozolomide. In the largest trial of temozolomide ever conducted - results recently presented at ESMO by Patel et al.- response rates were 10% for dacarbazine vs. 14.8% for temozolomide, but there was no difference in the overall survival or the progression-free interval between these regimens. Dacarbazine and temozolomide responses do not seem to confer survival benefit in part because these responses are rarely durable. The 10% of patients who responded to the anti-CTLA4-blocking antibodies exhibit characteristically and qualitatively different kinds of responses in metastatic stage-4 disease. When looking at the difference between the phase-3 and phase-1/2 trials, the phase-1/2 results clearly show that for tremelimumab there are very durable, high-quality responses--and the same can be said for ipilimumab. But the problem is, when you conduct a conventional trial in advanced metastatic melanoma to look at median survival, the survival median provides a different readout than the readout of durable responses. The quality of responses to tremelimumab and ipilimumab are still worthy of pursuit. The fact that the phase-3 trial of tremelimumab shows a little better outcome than dacarbazine in terms of median survival does not reflect these high-quality responses that go out well past six months, and will take different follow-up to document. So that is what is going on now: the long-term follow-up of those patients to make a qualitative assessment of the kind of response that they exhibited is really what we need. Looking at the data from the phase-3 presentation by Ribas, the one thing that may have weighed differentially in favor of tremelimumab in the forest plot of the data was higher lactate dehydrogenase (LDH). This is curious when you think about it. It may or may not be real, but if patients who have higher LDH (perhaps worse disease) benefit more from tremelimumab than from dacarbazine or temozolomide, the study was designed in a way that may have disfavored the anti-CTLA4-blocking antibody. The protocol excluded those people who had higher than twofold elevated LDH – so, by the design of the trial, curiously the outcome may have been slanted in favor of temozolomide or dacarbazine. Finally, it remains to test the role of anti-CTLA4 blocking antibodies in the disease setting where we have found the greatest relative benefit for other immunotherapy, such as IFN alpha. The adjuvant exploration of anti-CTLA4 blocking antibodies may show even greater relative benefit and warrants phase-3 study in relationto IFN alpha. In the previous slide, I bet you were wondering why was the CD3 on the graphic. It is needed for the propagation of the T-cells. T-Cell final development occurs in the Thymus. The thymus is a multi-lobed organ that is composed of a cortical and medullary area. During the T-Cell development, the cell moves through the different lobes due to the different microenvironments. Most of the cells that enter the thymus never make out alive to become a mature Naïve T-cell. A naive T cell or Th0 cell is a T cell that has differentiated in bone marrow, and successfully undergone the positive and negative processes of central selection in the thymus. In the Negative process, the T cell goes through a rigorous selection to self antigen tolarence before it is released into circulation. Once in circulation, the cells are able to respond to novel pathogens that the immune system has not yet encountered. Is everyone with me so far? If I don't know , I will tell you and or try to look them up. And YES, Dr. Kirkwood's therapy is only one Data point. But I am Happy to be that data point!!!!! In tring to figure out why my therapy has worked so far, I came across a major discrepancy in dosage used compared to the clinical trial by Dr. Rosenberg. His maximum was 3.0 mg/Kg of CTLA-4 and I did 15 mg/Kg. That is a 5 fold increase. I do know he used Ipilimumab and I used Tremelimumab (from Pfizer). They are both anti-CTLA-4. They both have a molecular weight of 145.4 kDa. and ~150 kDa respectively. Half lives of 15 days and 21 days simular. So why the great Disparity in dosage. Could that be a flaw in the trial? Tumor regression and autoimmunity in patients treated with cytotoxic T lymphocyte-associated antigen 4 blockade and interleukin 2: a phase I/II study. Maker AV, Phan GQ, Attia P, Yang JC, Sherry RM, Topalian SL, Kammula US, Royal RE, Haworth LR, Levy C, Kleiner D, Mavroukakis SA, Yellin M, Rosenberg SA. Surgery Branch, National Cancer Institute, National Institutes of Health, CRC Room 3-3940, 10 Center Drive, MSC 1201, Bethesda, MD 20814, USA. BACKGROUND: Cytotoxic T lymphocyte-associated antigen (CTLA)-4 can inhibit T-cell responses and is involved in tolerance against self antigens. We previously reported autoimmune manifestations and objective cancer regressions in patients with metastatic melanoma treated with CTLA-4 blockade. The possibility of activating tumor-reactive T cells while removing inhibitory activity with CTLA-4 blockade has stimulated interest in using anti-CTLA-4 antibodies in combination with other cancer immunotherapies to improve clinical outcomes. In this study, we assessed the antitumor activity and autoimmune toxicity of CTLA-4 blockade in combination with an immune-activating stimulus, interleukin (IL)-2, in patients with metastatic melanoma. METHODS: Thirty-six patients received anti-CTLA-4 antibody every 3 weeks. Three patients per cohort received doses of .1, .3, 1.0, and 2.0 mg/kg. Twenty-four patients received 3.0 mg/kg. All patients received IL-2 therapy (720,000 IU/kg every 8 hours to a maximum of 15 doses). RESULTS: Eight patients (22%) experienced objective tumor responses (three complete and five partial), including metastases in the lungs, lymph nodes, mediastinum, and subcutaneous tissues. Six of the eight patients have ongoing objective responses at 11 to 19 months. Five patients (14%) developed grade III/IV autoimmune toxicities secondary to anti-CTLA-4 administration, including four patients with enterocolitis and one with arthritis and uveitis. CONCLUSIONS: There is not evidence to support a synergistic effect of CTLA-4 blockade plus IL-2 administration, because the 22% objective response rate is that expected from the sum of these two agents administered alone. Durable cancer regressions were seen in patients treated with this combination. Long term exposure to CP-675,206 is not known to be required to sustain clinical benefit. "I don’t think we can draw any conclusions yet based on your experience with a single dose. However, one thing we do know is that dose does matter. Last year at ASCO, we presented data showing that higher doses of ipilimumab (10 mg/kg) were better than 3 mg/kg or 0.3 mg/kg. I once again applaud you for your efforts to understand the excellent response which you have had." Day 29- 10/11/06, A couple of days ago, Dee noticed two new growths on my back. Iwas hoping for the best. Anyway, we got confirmation from the Hillman Center that it is 2 new tumors growing. This really stinks. I think it is time to take out the “Weed be Gone”. This is not what I was hoping to hear. It was decided that the CTLA-4 blockage therapy was to be terminated. My CD4+T cells were just about at maximum propagation. Dr. Kirkwood, decided that the next line of defense would be Interleukin-2 (IL-2). Response In 16% of the patients, tumors shrank or disappeared as a result of PROLEUKIN® IL-2 therapy. In 6% of the patients, the tumors disappeared completely. Results From these trials, it was determined that a patient whose tumors completely disappeared from the treatment remained cancer-free for a median of 4.9 years. I needed to washout the CTLA-4 blockage and have some test run before I would be accepted into the next trial. We know from the PK studies that it would take 42 days to eliminate the antibodies from my system. Day 43-10/25/06, I got the results back from the Scans and it wasn’t good. The cancer is spreading in my lungs quite rapidly according to the CT scans. There are now over 40+ nodules ranging from 15 mm down to <>Day 50- 11/1/06, the first cycle of High dose Interleukin-2 (IL-2). It just so happen to be the maximum propagation of the CD8+ T cells. All of the anti-CTLA-4 is washed out. We also, most likely have the most CD4+ T reg cells. These are the cells that help regulate the immune response so it doesn’t go into overdrive and cause an autoimmune response. If we reset the clock for the second therapy (LI-2), then we can follow the activation of the CD8+ T-cells. My body has become a big Erlenmeyer flask. Erlenmeyer flasks are used in microbiology for the preparation of microbial cultures. So on day 50- 11/1/06, we innocuated my body with IL-2 – a growth factor. So based on the Itoh study, I should be activating the CD8+ T-cells into a mature state (TILs and LAK cells.) It should take roughly 50 days they would be at there maximum growth phase. On 78th day 11/29/06, the second cycle of IL-2 was administered. It was pushed back a week due to the Thanksgiving Holiday. I completed 8 doses which is the average that patients can withstand. On day 93 12/14/06, I had another CT scan. I am trying to recover between cycles. On day 98 12/19/06 we got the CT Scan Results: What a Christmas Present!!!!!! The tumors were shrinking!!!!!!! As you can see, the timing and the players of this Orchestration all fell into place. A single Bullet of Monoclonal antibodies started the whole sequence of events which lead to the restarting of my immune system. Without that bullet, there would have been no "Danger Signal"
"Melanoma and the Magic Bullet (Monoclonal Antibodies)"
In 2006, after two fail attempts (Interferon and Dacarbazine with Patrin) to stop the progression of my melanoma, I was able try CTLA-4 Blockage. It was one of my first choices, but due to protocol, I had to try the FDA approved therapy first. I had researched this monoclonal antibody. On 10-24-2005 when I was first diagnosed with melanoma, I contacted Dr. Luis H. Camacho who was currently at MD Anderson. "Early testing of an experimental human monoclonal antibody showed a striking benefit in patients with advanced melanoma, say researchers at The University of Texas M. D. Anderson Cancer Center, who presented their findings at the annual meeting of the American Society of Clinical Oncology. Of 39 patients given a single injection of CP-675,206 (known as CP-675), tumors disappeared in three patients, shrunk in a fourth patient, and cancer stopped growing in five other patients. These responses have remained since their initial treatment, which ranged from 13 to 28 months ago. At the time of the request, I was not at the correct stage but I knew that this might be the path of the future. I did contact him and we discussed my options at that time. I was just learning the ropes. On 9/3/06 I contacted Dr. Rosenberg just in case I needed a back up plan if the CTLA-4 blockage did not work. At that time I did not know I was the wrong HLA-02 type for Rosenberg’s trials. “I am Contacting Dr. Steven A. Rosenberg at the National Cancer Institute in Bethesda, Maryland. He is the lead the researcher on the Gene Therapy Trials. Log onto the CBS website for the story!!!!!! Dr. Rosenberg, I just got the news of your Gene Therapy Experiments. The initial results look somewhat promising. I applauded you and your team for making great strides in the cure for melanoma cancer. I am a cancer patient (48 yrs. old) under the care of Dr. John Kirkwood at the Hillman Cancer Center at the University of Pittsburgh. I have gone through a wide incision, lymph nodes removal, Interferon therapy, and Dicarbazine therapy without success. I am presently on track to start a clinical trial with CTLA-4 monoclonal antibodies September 13, 2006. I have some tumors on my right side of my back and some in each lobe of my lungs. I would like to be considered for your next round of Gene Therapy in the coming months if I have no response to the CTLA-4 treatment. Please let me know if you would need a copy of my medical records to date. Thanks again for the great work you are doing and I hope to hear from you in the near future. On 9/5/06 I received a call from Dr. Rosenberg’s office this morning while I was at Dr. Marino’s office. Kathy Morton (Research Nurse) contacted me by phone and asked a few questions about my health. She went on to say if I go with the CTLA-4 therapy, it would take about 2 months to washout before I could try the Gene Therapy. They would also have to do a colon biopsy to check the colon for any adverse conditions from the CTLA_4. She then gave me her direct phone number if I want to pursue the gene therapy at a later date. 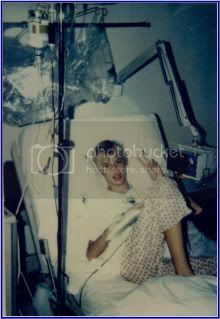 So, on 9/13/06 (day 1)I had my first and only infusion of anti-CTLA-4 monoclonal antibodies. This was done as an outpatient procedure. Anti-CTLA4 monoclonal antibodies block the ability of CTLA4 to down-regulate T cell proliferation. The theory behind this therapy is that by decreasing the inhibitory signal, there will be a subsequent increase in the number of activated T-cells available, to improve the ability of the T-cells to recognize melanoma cells as non-self. Before we can go any further, we need to know the clinical pharmacokinetics (pk)of anti-CTLA-4 monoclonal antibodies. Base on published papers, the predicted half-live of the antibody is around 3 weeks.11 This means your body will eliminate half the dose that was infused in you in about 21days. So, in 42 days or there about, the drug is completely gone from your system. I started my CTLA-4 treatment at 9:15 am at 100 ml/hr and I had 500 mls hanging on my rack (Miss Daisy). I call the rack Miss Daisy because I have to take it with me where ever I go which includes the bathroom. I am driving Miss Daisy!! This will take us to 3:15 pm and then they draw blood for a pk study an hour later. So, we won’t get out until about 4:30 pm and home until 10:00 pm. Day 7-9/19/06 “Along with the fatigue, my muscles ache like they have lactic acid in them”. Is this an indication of something? All immune cells begin as immature stem cells in the bone marrow. Day 15 -9/27/06 about half the CTLA-4 antibodies are depleted. It appears that the CTLA-4 has stimulated my immune system. In the pass week, I noticed that there was redness around the area where my tumors are located. Also it is becoming quite tender in that area. This is Great news!!!!! It appears that the treatment my have kick started my immune system. The only way we will know for sure is another CT scan. That is not scheduled until November 23rd. This inflammatory response provides a third signal that acts directly on T cells, referred to as the “danger signal”. “This signal was found to optimally activate TH1 differentiation and lead to clonal expansion of T cells12. With this clonal expansion of the T cells and the secretion of IL-2, The Immune system is gearing up to make an assault on the foreign invaders, the tumors. Base on the above data, it would take about 49 days for my activated T cells to reach maximum propagation.